With a steady rise in cadet numbers over the past few months, it became apparent that we needed to enhance and develop the current Cadet Non-Commissioned Officer (NCO) structure in order to recognise and develop leadership skills and to ensure the efficient running of parade and weekend activities. Without Cadet NCOs, RAF Air Cadet Squadrons simply couldn’t function, for as well as leaders they are also role models who demonstrate the standards that new cadets should aspire to. The selection of Cadet NCOs is never an easy task, for all squadron members have something to offer and as time goes by, their participation list increases making the filling of a limited number of vacancies even harder. 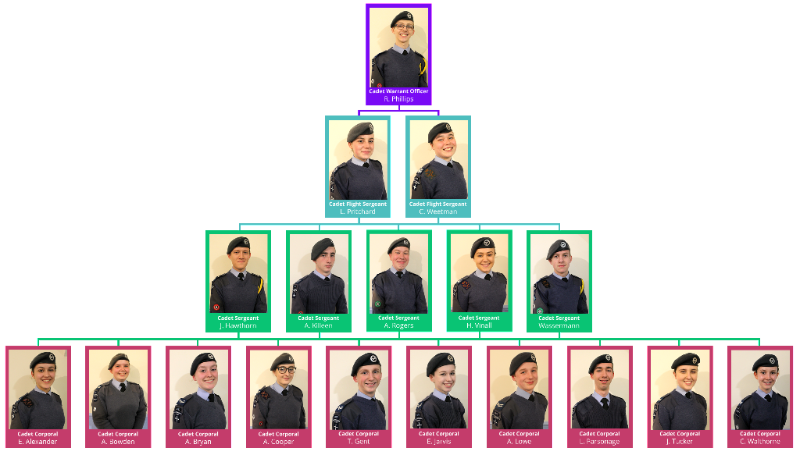 Having sat down as staff and made our decisions, we now have an improved Cdt NCO structure which will serve the three squadron flights well… well, almost, as there is one more promotion to make. On this, my lips are sealed but I think we will ask the Regional Commandant to present this after our Morris Trophy inspection on the 20th April. Below: Cadet Flight Sergeant C. Weetman, Flight Lieutenant G. Vince RAFVR(T), Cadet Sergeant J. Hawthorn and Cadet Sergeant H. Vinall. Below: Cadet Corporals J. Tucker, C. Walthorne, A. Lowe, Flight Lieutenant G. Vince, Cadet Corporals A. Bryan, E. Alexander-McGowan and T. Gent. Congratulations are due to those who were promoted recently whether as new Cadet Corporals or further promotion to Cadet Sergeant and Cadet Flight Sergeant. The opportunity to develop within your new roles is there for the taking, with both squadron and wing Cadet NCO training courses being organised for you. Embrace the responsibility that goes with your new rank in the knowledge that we have full confidence in your abilities, and inspire others to follow in your footsteps.